Austrian company Guger Technologies (g.tec) has developed a brain-computer interface that can be used to "type" short text messages simply by staring at letters on a screen. The interface could be used by people who are able to move only their eyes, allowing them to speak, via text-to-speech software, or to send short messages to other computer systems, including social networks, according to the company. It is demonstrating the system at Cebit.Labs, a section of the Cebit trade show devoted to research projects. 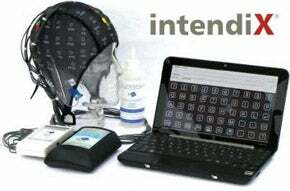 The system, called intendiX, consists of a tight-fitting skull cap fitted with a number of electroencephalograph (EEG) electrodes, a pocket-sized brainwave amplifier, and a Windows application that analyzes and decodes the brainwaves. The amplifier can be connected to the PC via Bluetooth, so the user doesn't have to sit next to the PC. The company's target users will need help from a family member or caregiver to put on the cap. Traditional EEG analysis systems require hours of training time to learn the user's normal brainwave patterns and identify key variations, but intendiX can gather sufficient data after just five to 10 minutes of use, said Markus Bruckner, an engineer who works in support and research at g.tec. IntendiX works by watching out for a brainwave pattern known as P300 ERP (event-related potential), which appears around 300 milliseconds after a stimulus such as the appearance of a bright light. "It's the same signal when you see a car's brake lights in front of you," said Bruckner. To enter a message using intendiX, the user must stare at each of its letters in turn on a virtual keyboard displayed on a screen. The software flashes each of the columns of letters in turn until the user's brain reacts to the flash of the column containing the chosen letter, then it flashes each of the rows in turn until it detects a response: It then "types" the letter at the intersection of the row and column detected. "It takes 40 seconds per character in the beginning, but in the lab we have speeded up to 0.9 seconds per character," said Bruckner. It's taken over two decades to get this far: In their 1988 scientific paper, "Talking off the top of your head: A mental prosthesis utilizing event-related brain potentials," Larry Farwell and Emanuel Donchin reported that "The characters can be communicated with reliability at the rate of 1 character every 26 seconds, or 2.3 characters a minute" by detecting variations in the P300 brainwave in response to the flashing of a 6-by-6 grid of letters and symbols. Farwell and Donchin saw their "mental prosthesis" as a way to help people suffering from "locked-in syndrome" to summon caregivers or communicate their needs. Intendix can also be used for this, but also for more frivolous purposes, such as social networking. "We have an interface for Twitter," said Bruckner. The company also demonstrated another interface that detects a different brainwave, the steady-state visually evoked potential (SSVEP). Four white LEDs on the interface pulse at different frequencies, and the system can use the frequency of the brainwave evoked to determine at which LED the user is staring. In its demo, g.tec used the interface like a joystick to direct a robot to move forward, back, left or right, but the LEDs needn't be collocated, said Armin Schnürer, responsible for software engineering at g.tec. For example, he said, the LEDs could be placed on different objects around a room, such as a door opener or a light switch, allowing someone to control elements of their environment by looking at them. Today, both systems use "wet" electrodes, which pick up the brainwaves using a conducting gel under the skullcap, but the company is working on a new version using dry electrodes, said Bruckner. This is not the company's first trip to Cebit: In 2007 it displayed a brain interface the size of a shoebox that could be used to play the videogame Pong with a few hours' training, but the system on show this year is much more compact and quicker to use. Cebit runs through Saturday at the fairgrounds in Hanover, Germany.